This is a ridiculous watch. And that’s the beauty of the thing. The watch world does not need the 597th Kickstarter campaign for a basic three-hander that “cuts out the middleman”—we need the Alexander Calder mobile-inspired handset of this unconventional take on time telling. At $135, this Miyota quartz-powered piece is a fun way to introduce the architects in your life to watches, or add a punch of color to your collection. The handset on this 40mm watch is simpler than meets the eye. The silver shape is the second hand. The large blue shape is the hour hand. The minute hand is the smaller red shape—with a hole in it to call out the tip. That addresses one complaint I had with the similarly colorful Mr. Jones Watches Colour Venn—the perfectly circular hands made it tough to pick out the time. Projects Watches (with Calder’s inspiration) have solved that problem quite elegantly. 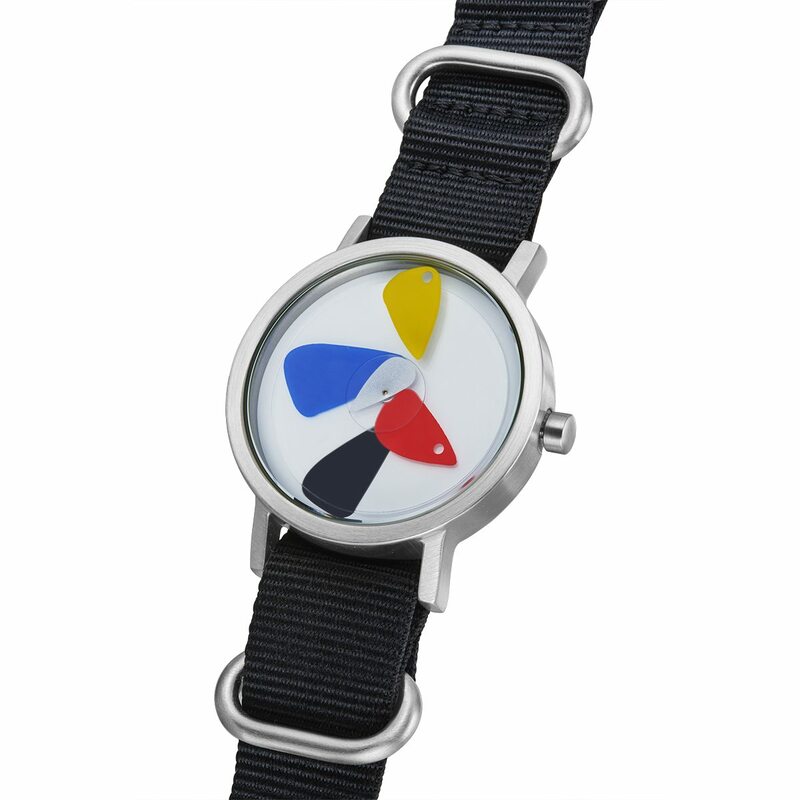 The yellow shape at 12:00 is attached to the crystal and the black shape at 6:30 is part of the dial; both are there just to add some depth and reinforce the Calder inspiration. Alas, like most Projects watches, this one is quartz-powered. That tiny silver second hand sitting in the middle of the mobile jumble would be much more satisfying if it swept instead of ticked. Mr. Jones produces mechanical watches that compete for the same whimsical and inexpensive slots in your watch box; Project should consider upgrading their movements to compete more directly with Mr. Jones. Who’s it for? Architectural horologists. Would I wear it? I wish it were an auto, but I love these whimsical handsets enough that I might just. What I’d change? I’d change the strap and opt for a cheap Chinese mechanical movement instead of the Miyota quartz. Standout feature? It’s a Calder-inspired mobile on your wrist.